This article is about events of 1916 in Ireland. For the unconnected 2004 US musical, see Easter Rising (musical). The Easter Rising ( Irish: Éirí Amach na Cásca),  also known as the Easter Rebellion, was an armed insurrection in Ireland during Easter Week, April 1916. The Rising was launched by Irish republicans to end British rule in Ireland and establish an independent Irish Republic while the United Kingdom was heavily engaged in the First World War. It was the most significant uprising in Ireland since the rebellion of 1798, and the first armed action of the Irish revolutionary period. Organised by a seven-man Military Council of the Irish Republican Brotherhood,  the Rising began on Easter Monday, 24 April 1916, and lasted for six days. Members of the Irish Volunteers—led by schoolmaster and Irish language activist Patrick Pearse, joined by the smaller Irish Citizen Army of James Connolly and 200 women of Cumann na mBan—seized key locations in Dublin and proclaimed an Irish Republic. The British Army brought in thousands of reinforcements as well as artillery and a gunboat. There was fierce street fighting on the routes into the city centre, where the rebels put up stiff resistance, slowing the British advance and inflicting heavy casualties. Elsewhere in Dublin, the fighting mainly consisted of sniping and long-range gun battles. The main rebel positions were gradually surrounded and bombarded with artillery. There were isolated actions in other parts of Ireland, with attacks on the Royal Irish Constabulary barracks at Ashbourne, County Meath, County Cork and in County Galway, and the seizure of the town of Enniscorthy, County Wexford. Germany had sent a shipment of arms to the rebels, but the British had intercepted it just before the Rising began. Volunteer leader Eoin MacNeill had then issued a countermand in a bid to halt the Rising, which greatly reduced the number of rebels who mobilised. With much greater numbers and heavier weapons, the British Army suppressed the Rising. Pearse agreed to an unconditional surrender on Saturday 29 April, although sporadic fighting continued until Sunday, when word reached the other rebel positions. After the surrender the country remained under martial law. About 3,500 people were taken prisoner by the British, many of whom had played no part in the Rising, and 1,800 of them were sent to internment camps or prisons in Britain. Most of the leaders of the Rising were executed following courts-martial. The Rising brought physical force republicanism back to the forefront of Irish politics, which for nearly 50 years had been dominated by constitutional nationalism. It, and the British reaction to it, led to increased popular support for Irish independence. In December 1918, republicans, represented by the reconstituted Sinn Féin party, won 73 seats in a landslide victory in the general election to the British Parliament. They did not take their seats, but instead convened the First Dáil and declared the independence of the Irish Republic. The Soloheadbeg ambush started the War of Independence. Members of the Irish Citizen Army outside Liberty Hall, under the slogan "We serve neither King nor Kaiser, but Ireland"
The Acts of Union 1800 united the Kingdom of Great Britain and the Kingdom of Ireland as the United Kingdom of Great Britain and Ireland, abolishing the Irish Parliament and giving Ireland representation in the British Parliament. From early on, many Irish nationalists opposed the union and the ensuing exploitation and impoverishment of the island, which led to a high level of depopulation. Opposition took various forms: constitutional (the Repeal Association; the Home Rule League), social ( disestablishment of the Church of Ireland; the Land League) and revolutionary ( Rebellion of 1848; Fenian Rising). The Irish Home Rule movement sought to achieve self-government for Ireland, within the United Kingdom. In 1886, the Irish Parliamentary Party (IPP) under Charles Stewart Parnell succeeded in having the First Home Rule Bill introduced in the British parliament, but it was defeated. The Second Home Rule Bill of 1893 was passed by the House of Commons but rejected by the House of Lords. The Third Home Rule Bill was introduced by British Prime Minister H. H. Asquith in 1912. Unionists, who were Protestant, opposed it, as they did not want to be ruled by a Catholic-dominated Irish government. Led by Sir Edward Carson and James Craig, they formed the Ulster Volunteers (UVF) in January 1913. In response, Irish nationalists formed a rival paramilitary group, the Irish Volunteers, in November 1913. The Irish Republican Brotherhood (IRB) was a driving force behind the Irish Volunteers and attempted to control it. Its leader was Eoin MacNeill, who was not an IRB member. 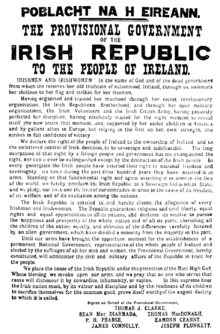 The Irish Volunteers' stated goal was "to secure and to maintain the rights and liberties common to all the people of Ireland". It included people with a range of political views, and was open to "all able-bodied Irishmen without distinction of creed, politics or social group". Another militant group, the Irish Citizen Army, was formed by trade unionists as a result of the Dublin Lock-out of that year. When the Irish Volunteers smuggled rifles into Dublin, the British Army attempted to stop them and fired into a crowd of civilians. British Army officers then threatened to resign if they were ordered to take action against the UVF. By 1914, Ireland seemed to be on the brink of a civil war. The crisis was ended in August that year by the outbreak of World War I  and Ireland's involvement in it. The Home Rule Bill was enacted, but its implementation was postponed by a suspensory act until the end of the war. James Connolly—head of the Irish Citizen Army (ICA), a group of armed socialist trade union men and women—was unaware of the IRB's plans, and threatened to start a rebellion on his own if other parties failed to act. If they had done it alone, the IRB and the Volunteers would possibly have come to their aid;  however, the IRB leaders met with Connolly in January 1916 and convinced him to join forces with them. They agreed that they would launch a rising together at Easter and made Connolly the sixth member of the Military Council. Thomas MacDonagh would later become the seventh and final member. In early April, Pearse issued orders to the Irish Volunteers for three days of "parades and manoeuvres" beginning on Easter Sunday. He had the authority to do this, as the Volunteers' Director of Organisation. The idea was that IRB members within the organisation would know these were orders to begin the rising, while men such as MacNeill and the British authorities would take it at face value. When MacNeill learned from Vol. Patrick Whelan that the arms shipment had been lost, he reverted to his original position. With the support of other leaders of like mind, notably Bulmer Hobson and The O'Rahilly, he issued a countermand to all Volunteers, cancelling all actions for Sunday. This countermanding order was relayed to Volunteer officers and printed in the Sunday morning newspapers. It succeeded in putting the rising off for only a day, although it greatly reduced the number of Volunteers who turned out. Volunteers and Irish Citizens Army members inside the General Post Office, 25th of April 1916. The principal rebel positions at the GPO, the Four Courts, Jacob's Factory and Boland's Mill saw little action. The British surrounded and bombarded them rather than assault them directly. One Volunteer in the GPO recalled, "we did practically no shooting as there was no target". However, where the insurgents dominated the routes by which the British tried to funnel reinforcements into the city, there was fierce fighting. Elsewhere, at Portobello Barracks, an officer named Bowen Colthurst summarily executed six civilians, including the pacifist nationalist activist, Francis Sheehy-Skeffington. These instances of British troops killing Irish civilians would later be highly controversial in Ireland. Irish Volunteer units mobilised on Easter Sunday in several places outside of Dublin, but because of Eoin MacNeill's countermanding order, most of them returned home without fighting. In addition, because of the interception of the German arms aboard the Aud, the provincial Volunteer units were very poorly armed. Henry Street, Dublin, after the Rising. The shell of the GPO is on the right. The vast majority of the Irish casualties were buried in Glasnevin Cemetery in the aftermath of the fighting. British families came to Dublin Castle in May 1916 to reclaim the bodies of British soldiers, and funerals were arranged. Soldiers whose bodies were not claimed were given military funerals in Grangegorman Military Cemetery. Ruins of the Metropole Hotel on Sackville Street, next to the GPO. View of O'Connell Bridge, 1916, on a German postcard. The caption reads: Rising of the Sinn Feiners in Ireland. O'Connell bridge with Dublin city, where the fiercest clashes took place. General Maxwell quickly signalled his intention "to arrest all dangerous Sinn Feiners", including "those who have taken an active part in the movement although not in the present rebellion",  reflecting the popular belief that Sinn Féin, a separatist organisation that was neither militant nor republican, was behind the Rising. A total of 3,430 men and 79 women were arrested, although most were subsequently released. When the RIC attempted to arrest members of the Kent family in County Cork on 2 May, a Head Constable and one of the Kent brothers were killed in the ensuing gun battle. The other brothers were arrested. Most of those arrested were held at Richmond Barracks, Dublin. After the Rising, claims of atrocities carried out by British troops began to emerge. Although they did not receive as much attention as the executions, they sparked outrage among the Irish public and were raised by Irish MPs in Parliament. Shortly after the Easter Rising, poet Francis Ledwidge wrote "O’Connell Street" and "Lament for the Poets of 1916", which both describe his sense of loss and an expression of holding the same "dreams",  as the Easter Rising's Irish Republicans. He would also go on to write lament for Thomas MacDonagh for his fallen friend and fellow Irish Volunteer. A few months after the Easter Rising, W. B. Yeats commemorated some of the fallen figures of the Irish Republican movement, as well as his torn emotions regarding these events, in the poem Easter, 1916. Some of the survivors of the Rising went on to become leaders of the independent Irish state. Those who were executed were venerated by many as martyrs; their graves in Dublin's former military prison of Arbour Hill became a national monument and the Proclamation text was taught in schools. An annual commemorative military parade was held each year on Easter Sunday. In 1935, Éamon de Valera unveiled a statue of the mythical Irish hero Cú Chulainn, sculpted by Oliver Sheppard, at the General Post Office as part of the Rising commemorations that year – it is often seen to be an important symbol of martyrdom in remembrance of the 1916 rebels. Memorials to the heroes of the Rising are to be found in other Irish cities, such as Limerick. With the outbreak of the Troubles in Northern Ireland, government, academics and the media began to revise the country's militant past, and particularly the Easter Rising. The coalition government of 1973–77, in particular the Minister for Posts and Telegraphs, Conor Cruise O'Brien, began to promote the view that the violence of 1916 was essentially no different from the violence then taking place in the streets of Belfast and Derry. With the advent of a Provisional IRA ceasefire and the beginning of what became known as the Peace Process during the 1990s, the official view of the Rising grew more positive and in 1996 an 80th anniversary commemoration at the Garden of Remembrance in Dublin was attended by the Taoiseach and leader of Fine Gael, John Bruton. 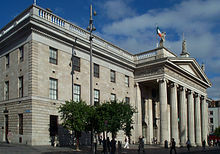 In 2005, the Taoiseach, Bertie Ahern, announced the government's intention to resume the military parade past the GPO from Easter 2006, and to form a committee to plan centenary celebrations in 2016. The 90th anniversary was celebrated with a military parade in Dublin on Easter Sunday, 2006, attended by the President of Ireland, the Taoiseach and the Lord Mayor of Dublin. There is now an annual ceremony at Easter attended by relatives of those who fought, by the President, the Taoiseach, ministers, senators and TDs, and by usually large and respectful crowds. Memorial in Cobh, County Cork, to the 1916 volunteers from that town.
" Easter, 1916", a poem by the renowned Irish poet and playwright W.B. Yeats, published in 1921. "The Foggy Dew" is a song by Canon Charles O'Neill, composed sometime after 1919, that eulogises the rebels of the Easter Rising. The Plough and the Stars is a 1926 play by Seán O'Casey that takes place during the Easter Rising. Insurrection is a 1950 novel by Liam O'Flaherty. The Red and the Green is a 1965 novel by Iris Murdoch that covers the events leading up to and during the Easter Rising. 1916, A Novel of the Irish Rebellion is a 1998 historical novel by Morgan Llywelyn. A Star Called Henry is a 1999 novel by Roddy Doyle that partly recounts the Easter Rising through the involvement of the novel's protagonist Henry Smart. At Swim, Two Boys is a 2001 novel by Irish writer Jamie O'Neill, set in Dublin before and during the 1916 Easter Rising. Rebel Heart, is a 2001 BBC miniseries. The theme music of the same name was composed by Sharon Corr. 1916 Seachtar na Cásca is a 2010 Irish TV documentary series based on the Easter Rising, telling about seven signatories of the rebellion. The Dream of the Celt is a 2012 novel by Mario Vargas Llosa based on the life and death of Roger Casement, including upon his involvement with the Rising. Rebellion is a 2016 mini-series about the Easter Rising. ^ a b c d e f 1916 Necrology. Glasnevin Trust. ^ "Department of the Taoiseach – Easter Rising". Taoiseach.gov.ie. Retrieved 13 November 2011. ^ Behrendt, Stephen C. (2010). British Women Poets and the Romantic Writing Community. JHU Press. pp. 244–5. ISBN 0801895081. Retrieved 23 August 2016. ^ "Those who set the stage" (PDF). The 1916 Rising: Personalities and Perspectives. National Library of Ireland. Retrieved 7 December 2009. ^ a b c d e f Chronology of the Easter Rising. Century Ireland – RTÉ. ^ Dorney, John. The Weapons of 1916. Irish Independent. 3 March 2016. ^ McGee, John. "Time to celebrate a centenary of Irish broadcast heroes". Irish Independent, 6 March 2016. ^ "Children of the Revolution". History Ireland. Volume 1, issue 23 (May/June 2013). ^ Ferguson, Stephen (2012). Business as Usual - GPO Staff in 1916. Mercier Press. p. 60. ISBN 9781856359948. ^ "Nurse Margaret Keogh, the first civilian fatality of the Rising". Irish Independent. 4 March 2016. ^ "Statement by Joseph Sweeney Curious Journey: An Oral History of Ireland's Unfinished Revolution". BBC. Retrieved 18 October 2009. ^ O'Brien, Paul. Heuston's Fort – The Battle for the Mendicity Institute, 1916. The Irish Story. 15 August 2012. ^ Dorney, John. "The North King Street Massacre, Dublin 1916". The Irish Story. 13 April 2012. ^ "Dublin may seek surrender letter". BBC News. 2006-01-09. Retrieved 2011-11-13. ^ O'Duibhir, Liam (2009). The Donegal Awakening. Mercier Press. pp. 39, 45, 76, 104, 255, 289, 292. ^ a b c d e f Dorney, John. The Easter Rising in County Wexford. The Irish Story. 10 April 2012. ^ a b c Dorney, John. The Easter Rising in Galway, 1916. The Irish Story. 4 March 2016. ^ a b c d Mark McCarthy & Shirley Wrynn. County Galway's 1916 Rising: A Short History. Galway County Council. ^ "40 children were killed in the 1916 Rising but they are barely mentioned in our history". TheJournal.ie. 29 November 2015. ^ Joe Duffy's list of Children Killed in 1916 Rising. ^ S. J. Connolly (2004). Oxford Companion to Irish History. Oxford University Press. p. 607. ISBN 978-0-19-923483-7. ^ a b c House of Commons debate, 3 May 1916: Resignation of Mr Birrell. Hansard. ^ House of Commons debate, 11 May 1916: Continuance of martial law. Hansard. ^ "Easter Rising 1916 – the aftermath: arrests and executions". The Irish Times, 24 March 2016. ^ "''The Green Dragon'' No 4, Autumn 1997". Ballinagree.freeservers.com. 31 March 2005. Retrieved 13 November 2011. ^ Bacon, Bryan (2015). A Terrible Duty: the Madness of Captain Bowen-Colthurst. Thena Press. ^ Yeates, Pádraig. A City in Wartime – Dublin 1914–1918: The Easter Rising 1916. Gill & Macmillan, 2011, p. ?. ^ Redmond, Dara. "Officer who exposed pacifist's murder". The Irish Times. 26 August 2006. ^ What was the Easter Rising?. Century Ireland – RTÉ. ^ "The loyalists spoke with an air of contempt, 'the troops will settle the matter in an hour or two, these pro-Germans will run away...' The Redmondites were more bitter, 'I hope they’ll all be hanged' ... 'Shooting’s too good for them. Trying to stir up trouble for us all.'" Ernie O’Malley, On Another Man's Wound, p. 60. ^ "Witness statement of Robert Holland" (PDF). Bureau of Military History. Retrieved 14 May 2013. ^ J. Anthony Gaughan, ed. (1998). Memoirs of Senator James G. Douglas; concerned citizen. University College Dublin Press. pp. 52, 53. ISBN 978-1-900621-19-9. Retrieved 30 May 2010. ^ "Ledwidge, Francis, Life works Criticism Commentary Quotations References Notes". ^ Brennan, Cathal. "A TV pageant, the Golden Jubille Commemorations of the 1916 Rising"
^ "Irish Station Names – Heroes of the Easter Uprising". www.sinfin.net. Retrieved 2016-07-23. ^ "O'Brien Coin Guide: Irish Pre-Decimal Ten Shillings". The Old Currency Exchange is a specialist dealer and valuer of coins, tokens and banknotes. 2016-03-27. Retrieved 2016-07-23. ^ "Commemorative €2 coin released to mark 1916 centenary". Retrieved 2016-10-05. ^ O’Brien, Conor Cruise (1972). States of Ireland. Hutchinson. pp. 88, 99. ISBN 0-09-113100-6. ^ "In pictures: Easter Rising commemorations". BBC News. 16 April 2006. Retrieved 29 March 2010. ^ Hertz, Kayla (16 December 2014). "Dublin's 1916 Rising Freedom Trail will be based on Boston's". Irish Central. Retrieved 11 September 2016. ^ "S.I. No. 27/1949 – The Republic of Ireland Act, 1948 (Commencement) Order, 1949". Irish Statute Book. Retrieved 10 June 2015. ^ "State Ceremonial". Ireland 2016. Government of Ireland. Retrieved 10 June 2015. ^ "RTÉ's acclaimed Easter Rising drama from 1966 is coming back to TV screens". The Journal. 8 March 2016. Retrieved 1 March 2016. Bell, J. Bowyer. The Secret Army: The IRA. ISBN 1-85371-813-0. Clayton, Xander (2007). Aud. Plymouth: GAC. ISBN 9780955562204. Ellis, Peter Berresford (2008). "1916: Insurrection or Rebellion? Making Judgements". In O'Donnell, Ruán. The Impact of the 1916 Rising: Among the Nations. Dublin: Irish Academic Press. ISBN 978-0-7165-2965-1. The Irish Times (1998) . 1916 Rebellion Handbook. Introduction by Declan Kiberd (reprint ed.). Mourne River Press. ISBN 9781902090054. Kennedy, Christopher M. (2010). Genesis of the Rising, 1912–1916: A Transformation of Nationalist Opinion. Peter Lang. ISBN 1433105004. Retrieved 1 April 2016. "Patrick Pearse and the European Revolt Against Reason," in The Journal of the History of Ideas, 50,4, 1989. Royal Commission on the Rebellion in Ireland (1916). Report. Command papers. Cd.8279. London: HMSO. Retrieved 11 September 2016. Royal Commission on the Rebellion in Ireland (1916). Minutes of Evidence and Appendix of Documents. Command papers. Cd.8311. London: HMSO. Retrieved 11 September 2016. Wikimedia Commons has media related to Easter Rising. Curran, Constantine Peter (1916). "1916 Rising Postcards". UCD Library, University College Dublin. doi: 10.7925/drs1.ucdlib_38376. Ucd Library Special Collections, UCD Library (1928). "Towards 2016". UCD Library, University College Dublin, Belfield, Dublin 4, Ireland. doi: 10.7925/drs1.ivrla_30530.